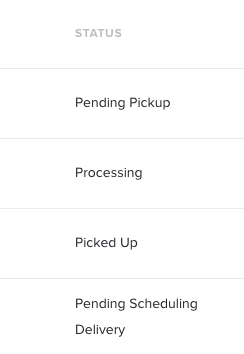 Pending Pickup A customer's order is scheduled for pickup. Picked Up The order has been marked as "Picked Up" by the driver (on the Driver App) or on the Dashboard. Processing The order is at the store, may have been detailed, and the cleaning process has begun. Pending Scheduling Delivery The order has been processed and marked "Ready for Delivery." If the customer has already selected a delivery time, it will be Pending delivery. If not, it will be Pending Scheduling Delivery until the customer does select a delivery time. Delivered The order has been marked as "Delivered" by the driver (on the Driver App) or on the Dashboard. Completed The customer has rated the order.